OMY DESIGNED WITH LOVE… Behind OMY are two designers, Elvire Laurent and Marie-Cerise Lichtlé, graphic artists and illustrators, both graduated from the Arts-Déco of Paris. 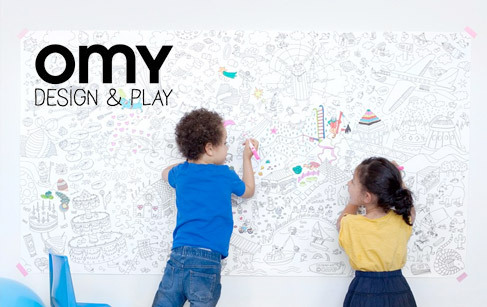 After creating their own graphic arts studio in 2005, they combined their enthusiasm and experience to form OMY Design & Play, a line of cheerful and creative products. OMY Design & Play proposes a range of joyful products, graphic and intelligent designs for the house, for all ages. Graphic designs to cover your walls, to be worn, or light up the night. From posters to clothing, the opportunities for experimentation are endless. The colours and words radiate, dance amongst the designs and forms, bringing playfulness and humour. With an ecological conscious, the materials (inks, paper, cotton) are chosen with quality and respect for the environment in mind.